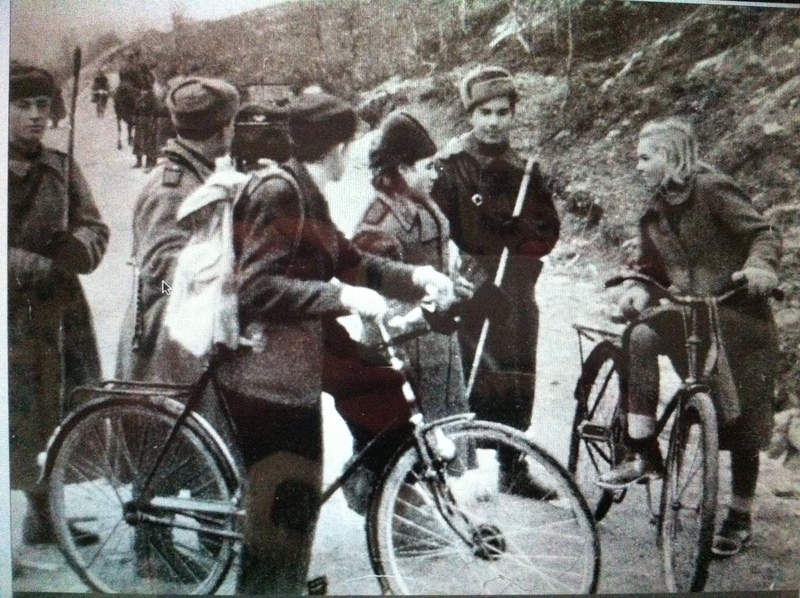 Norwegians meet Russian soldiers at the Bjornevatn mine in October 1944. There is a wealth of fantastically atmospheric material coming out of northern Norway at the moment in time for the 70th anniversary of the liberation of the north by the Red Army. The town of Kirkenes was bombed repeatedly from 1941 to 1944 by the Soviets as it was a key supply port for the German invasion of the Soviet Union, brought to a standstill for three years at the Litsa Front outside Murmansk. When the Russians launched a huge military onslaught in October 1944 the townspeople of Kirkenes fled to a massive iron ore mine 10kms outside the town called Bjornevatn, where they sheltered in the tunnels and waited for the fighting to end. It did – almost overnight – and when the German troops fled west, the Red Army soldiers moved in .. to find 3,000 people emerging from the mine! I interviewed Eva Larsen, one of the children who sought refuge in the mine, for my book, ‘Fire and Ice’. Singing and dancing ensued, as the Norwegians were free after four years of occupation, hugely outnumbered by the occupying Nazis. So now the papers are digging through their archives and publishing some of these great pictures again. Have a look at Finnmarken, the Sor-Varanger Avis and – in English – the Barents Observer. One of the amazing stories over the years has been of the ten babies who were born in the mine while waiting for the liberation. One of the babies was Eva Larsen’s brother. But now it emerges that there were actually ELEVEN babies born .. but the last one remained a secret because the father was a German. Now her story has been told and she says she feels better because at last the truth is out. So many people are living with secrets of the war… and I am glad to say a journalist in the north I met while researching ‘Fire and Ice’ – Yngve Gronvik of the Sor-Varanger Avis in Kirkenes – is committed to ensuring the truth is out there. ‘It would be great to show that the history of scorched earth gets out into the world,” Yngve writes, as he prepares to cover the 70th anniversary celebrations in Kirkenes this weekend, at which the Norwegian King, Prime Minister and Russian Foreign Minister will be present. ‘This is a part of the history that most Norwegians doesn’t know about, and it has to do with politics in the post-war years, of course. It’s complicated… and my book ‘Fire and Ice’ merely skims the surface, but thanks to the efforts and commitment of people like Yngve, the truth will find a way.. eventually. ‘Fire and Ice – the Nazis’ scorched earth campaign in Norway is published by The History Press on October 28th. This entry was posted in 20th Century, Arctic Circle, coastal guns, Finnmark, Finnmarken, German submarines, Germany, Hammerfest, history, Hitler, Honningsvag, Hopseidet, Housing, Hurtigrute, Nazi, Norway, prisoners of war, Scorched Earth, Second World War, Soviet Union. Bookmark the permalink.